Paul’s prayer for Philemon in Phmn 6 is very interesting. It’s seldom translated well, however. The ESV leaves things a bit ambiguous, which isn’t necessarily wrong, in what Paul is praying for Philemon: “and I pray that the sharing of your faith may become effective for the full knowledge of every good thing that is in us for the sake of Christ.” Just what does “the sharing of your faith” mean? 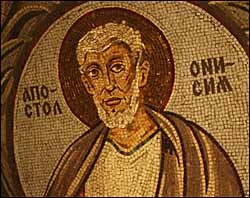 Is it Philemon’s sharing a common faith with Paul, Onesimus, and the other named Christians in the letter? Or, is it Philemon’s evangelistic practice? Paul emphasizes throughout the letter how everyone in the faith belongs to one another in the richest possible sense. He employs a number of rhetorical strategies to demonstrate this, not least the pervasive familial language. The named Christians in the letter are all brothers and sisters in Christ. He stresses the belonging-to-one another character of our sharing in the faith. This letter is a powerful instance of Paul’s ministry of “imagination transformation.” He leads his reader(s) into a compelling consideration of the faith so that their vision of all things is reshaped according to the gospel. He prays that they will see things anew, be renewed in how they conceive of all things, and live accordingly. Great post, Tim. Indeed your translation reflects the original language well, especially the words “fellowship” and “unto”. “Faith” takes on a much richer and deeper meaning when it is not understood individualistically. The sharing of a common faithful trust in the crucified Christ is important – and comforting – for an apostle in jail and for the purposes of his letter to Philemon. Do you think that the phrase “all the good things” refers to the blessings which come from our partnership in the faith? Or could it refer to the good things which we can do for Christ? (cf. v. 14). I think the “all good things” refers to the richly-resourced reality that God has brought about with the New Creation and into which he has brought all those “in Christ.” It’s a place on the cosmic map–the church, this reality of God’s resurrection power, created by the Spirit. Paul wants Philemon to see it, to really grasp it, so that he will see its promise and act in accordance with it. If you could recommend one (or a couple if you want) commentary or book for understanding Philemon what would it be? I think Wright’s little volume on Col. / Phmn. is good, and I think John Barclay has an introduction to Philemon. I’d start there. Marianne Meye Thompson has a great commentary on Col. / Phmn., too, in the Two Horizons Commentary series that’s quite good.